The computer experiments, by academics at the University of Bristol, give rise to a huge variety of different knots, realising many that have been tabulated by pure mathematicians working in the field of knot theory. Waves surround us all the time: sound waves in the noise around us, light waves enabling us to see, and according to quantum mechanics, all matter has a wave nature. Most of these waves, however, do not resemble the regular train of waves at the shore of the ocean—the pattern is much more chaotic. Most significantly, the whirls and eddies form lines in space called vortices. Along these lines, the wave intensity is zero, and natural wave fields - light, sound and quantum matter - are filled with a dense tangle of these null filaments. Mark Dennis, Professor of Theoretical Physics in the School of Physics, said: "Although the computer models were framed in the language of quantum waves, these results are expected to be completely general, suggesting a new understanding of the complexity of the three-dimensional optical and acoustic landscapes that surround us every day." More than 40 years ago, Bristol physicians Professor Sir Michael Berry and Professor John Nye discovered vortices were originally understood to be a crucial part of wave phenomena. 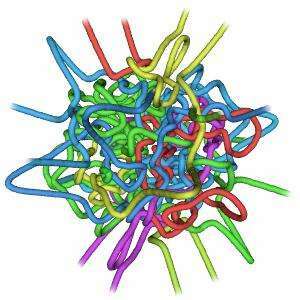 This work is part of the Scientific Properties of Complex Knots (SPOCK) project, a collaboration between the Universities of Bristol and Durham. The aim of the project is to create new computational tools and mathematical techniques for the analysis, synthesis and exploitation of knotted structures in a wide range of complex physical phenomena. The research, funded by the Leverhulme Trust, is published today in Nature Communications. Worth following the link to the article; Nature has it unpaywalled at the moment. Mate, how long are you going to keep up your ignorant rants and insults against him? He speaks to the topic in science terms; whereas your post does not even acknowledge that his many posts in the past on these vortices aspects were spot on. As is now being increasingly confirmed by more serious attention and investigation and experiments/hypotheses in the mainstream science community. So give him a break, mate, from your relentless ignorant blizzard of personal/political motivated science-empty and insulting posts which clutter up and create animosity in many of the otherwise most interesting 'cutting edge' topics/discussions. He may not be right on all matters, but try to be generous and objective enough to acknowledge when he is right on a/some matters. Try it, mate. It's only fair. What an epic Epitaph that would make for the man's grave stone or cremation-urn plaque, hey?